Dan Kutler was a three-time All-America swimmer at Northern California’s Cupertino High School before winning All-America honors at UCLA in 1991. Considered one of the Pac-10’s top sprinters and relay men, he was a member of the Bruins’ gold medal 400-Meter Medley Relay Team at the 1991 World University Games in England. In 1990, Kutler helped UCLA win a championship the Pac-10 400-Meter Medley Relay, and a silver medal finish in the 200-Meter Freestyle Relay. At the 1990 Olympic Festival, he won the 100-Meter Freestyle (51.50) and the 100-Meter Butterfly (55.20). 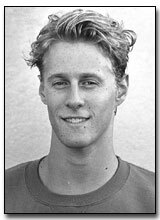 As a high schooler, Dan also won All-America honors as a waterpolo star.